Don’t miss this! This beautiful home is a Pre-approved short sale featuring 2 bedrooms and 2 bathrooms with loft. Rain or shine you can enjoy the views on your fully covered front porch. Need more storage, no problem here, there’s a matching outside storage unit. There’s plenty of room for your family and friends on the 1+/- acres of private, wooded property. The home has an all wood interior and appliances are included. So put this house on your list to see, you’ll be glad you did. Enjoy the privacy, stunning views and still be convenient to town, in this 2 bedroom 2 bathroom fully furnished mountain cabin. Relax on your deck as you take in the view or cozy up to the fireplace with a nice cup of coffee. The home features cathedral ceilings and walk in closets for plenty of storage. If you have a green thumb or just want to try your hand at growing your own vegetables or flowers, there’s a garden space just waiting for you. Call Kathy today and make an appointment to see this beauty. Rustic Lincoln log home located at 925 S. Brooks Cove Road, Hayesville, North Carolina. This 3BR 2BA home is a true Lincoln log home located on 3.5 +/- acres in Hayesville, NC and borders United States Forest Service (USFS). There are incredible long range mountain views with peaks and valleys that can be seen from many rooms in this home. This home has rustic all wood interior, with custom kitchen cabinets and large eat-at kitchen counter. The living room consists of cathedral ceilings, custom Costa Rica pine wood flooring, and a stacked stone masonry fireplace. There are 2 bedrooms on the main floor with full bathroom. The upstairs includes a master bedroom with large bathroom and a sitting room overlooking the main floor of the home. This home is great for a private residence or part-time vacation home. The furnishings were tastefully selected and can be negotiated with the purchase price. This is a golden opportunity for someone that needs seller financing. The home is priced at $249,900.00. Don’t miss out on viewing this spectacular mountain home. Let the games begin in your very on game room featuring a stack rock fireplace. 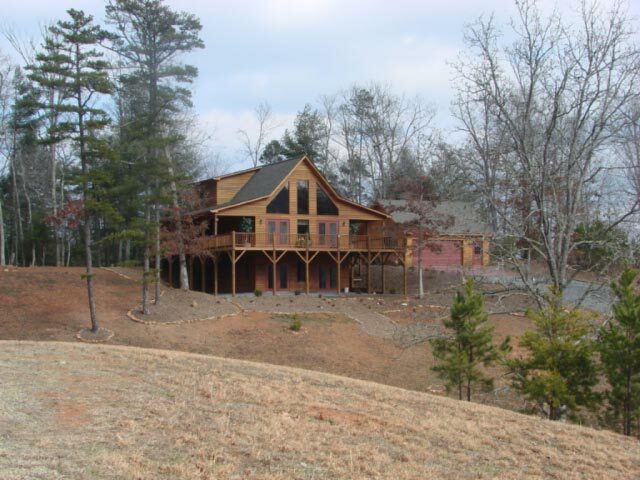 This 3 bedroom 4 bathroom log home features wrap around porches and a private master suite with fireplace. Enjoy the beautiful views from the outdoor jaccuzzi tub, relax with your favorite hobby in the log sided workshop or work from home in your office computer room. There’s no lack of space in this amazing house, so call Kathy and make it a point to take a good look at this beauty. This home has so many beautiful features. A jewel that is hard to find with this quality. Come enjoy this amazing gate mountain community and this 2 bedroom 3 bathroom home on 1.78 +/- acres. Take a stroll through the wooded back yard that leads to a creek. Family coming to visit is no problem with the finished lower level that has a great room, bonus room, mechanical room and bath. Take that glass of iced tea out on one of your two covered porches and breathe in all this wonderful mountain air and take in all the wildlife around you. This is a must see and priced at $299,000, so call Kathy for more information. This Private Estate has amazing views all around. Come see this upscale 3 bedroom 3 bathroom home with 5.58+/- acres of pasture and woods. This Home features a Gourmet kitchen with Hickory custom cabinets and Floor to Ceiling Stacked Stone Fireplace. The Open Dining area opens to sunroom & screened porch. There are Two Master Bedrooms and an Additional Bedroom and Bath. The Laundry Room has a walk-in Pantry. Beautiful open Great Room, hardwood floors, and outside there is a large 20’x40′ workshop. Call Kathy for more information on this great home. Bring your fishing pole and canoes to this 4 bedroom 4.5 bathroom custom log home on 4+ acres with pond. This home has all the features for entertaining and would make a great Bed & Breakfast. Enjoy one of the four Jaccuzzi tubs while the kids play in their very on playhouse. Gather the whole family around the beautiful country kitchen for some real memories that will last a lifetime. Take a nap or read a good book on one of the 2 covered porches. This is definitely the one to see, priced at $599,000. Call Kathy for more information.